Read our Betsy Ross Facts to learn all about this inspiring woman of the Revolutionary War. 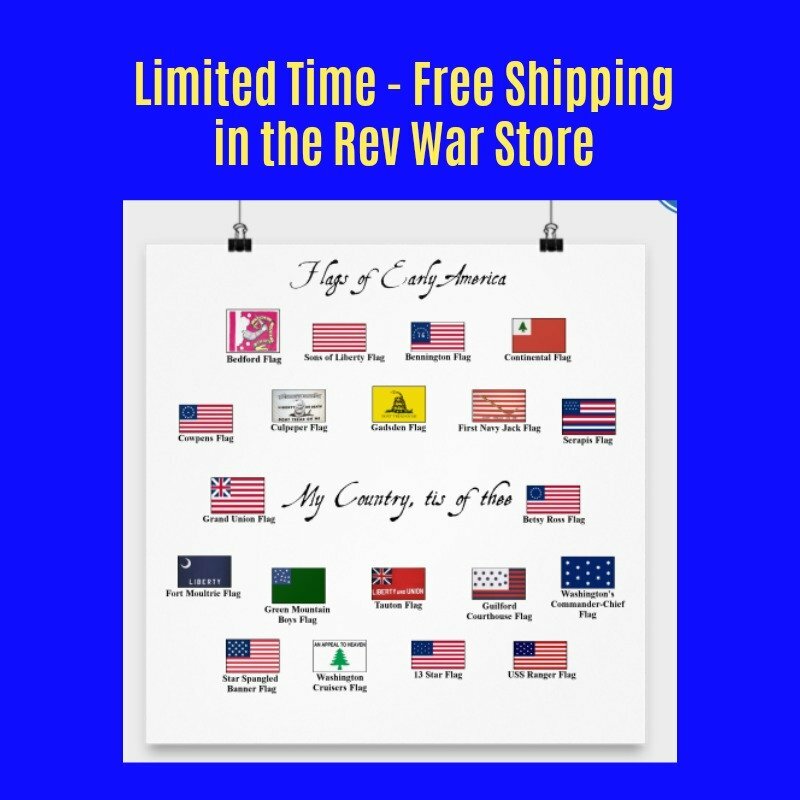 You may know about the Betsy Ross Flag, but you probably didn't know that Betsy lost two husbands to the war, was kicked out of her church for marrying the wrong guy and was born into a family with 17 children! You will see the Betsy Ross House where she made the flag, the Betsy Ross Signature and find out how to make a 5-pointed star with one snip, a feat she performed for George Washington that helped her get the job of making the first flag of the United States. Learn about all these interesting Betsy Ross Facts and more below. Betsy Ross was born Elizabeth Griscom in Philadelphia, Pennsylvania. Samuel Griscom was a prominent carpenter in Philadelphia. He was the third generation of his family to work in this trade and helped build the belltower on Independence Hall. Both his name and his father's name are inscribed on the wall of Carpenter's Hall in Philadelphia, the home of the nation's oldest trade organization. Betsy's grandfather, Andrew, emigrated to New Jersey from England in 1680. He was a very strong Quaker. He met and became a personal friend of William Penn, the founder of Pennsylvania and came to the colony later to be a part of Penn's "Holy Experiment," which was to govern an entire colony based on their Quaker religious beliefs. Rebecca James Griscom was the daughter of a prominent Philadelphia Quaker merchant. She and Samuel were married on February 6, 1741. They had 17 children. Both of them died from yellow fever in the Philadelphia Yellow Fever Epidemic of 1793. Betsy Ross was the 8th of 17 children. The Little Rebel - Betsy Ross was called this name by British soldiers who occupied her house in the winter of 1777-78 because of her strongly patriotic views. Quakers believed strongly in the equality of women with men. Being a Quaker, Betsy went to a Quaker public school known as the Rebecca Jones School for Quakers, a school chartered by Pennsylvania founder William Penn. There she learned reading, writing, arithmetic, geography and history. The Quaker children were also instructed in a trade which they worked on for four hours a day. Betsy probably sewed, a skill she had learned from her great-aunt Sarah Elizabeth Ann Griscom. Betsy made quilts and other needlework with complicated designs, a skill for which Betsy won many local prizes. Betsy Ross was a long time member of the Quaker church. Her great-grandfather, Andrew Griscom moved from New Jersey to Pennsylvania to join William Penn's "Holy Experiment," an attempt to govern a colony based on Quaker beliefs taken from the Bible. Betsy grew up in the Quaker church and remained there until she married John Ross. John Ross was the son of an assistant rector of the Episcopalian Christ Church, the most prominent church in Philadelphia. Betsy was ex-communicated from the Quaker church and disowned by her family after marrying Ross because the Quaker group she was a part of did not approve of intermarrying with those of other Christian denominations. Betsy Ross then became a member of Christ Church where she met many prominent citizens of Philadelphia, including George and Martha Washington. After John's untimely death in a gunpowder accident during the war, Betsy returned to the Quakers, but this time joined the "Free" Quaker church. The traditional Quaker church held to a pacifist view that war was wrong in all circumstances. Consequently, some Quakers who wanted to support the war effort broke off from the main group to form their own churches, known as the "free" or "fighting" Quakers. Betsy joined this group and was an active member for the rest of her life. Her signature can be found regularly in the attendance records of the Free Quaker Meeting House. Betsy attended this church for many years with her third husband John Claypoole who came from a Quaker family that was close friends of William Penn. In 1834, Betsy Ross and John Price Wetherill were the only two remaining Free Quakers attending church at the Meeting House. They decided it was time to close the church for good and the two of them saw the doors closed and locked for the last time. Betsy had attended the church for over 50 years. This Free Quaker House Meeting building, was built in 1783 and still stands today only a few blocks from the Betsy Ross House in Philadelphia. You can see Betsy Ross' Bible on display at the Betsy Ross House as well. When Betsy Ross finished school as a teenager, her father had her enrolled in an apprenticeship with a local upholsterer named William Webster. This is where she met her husband John Ross, who was also an apprentice. The two married and began their own upholstery business, making such things as furniture coverings, clothing and household items such as curtains, bedspreads, pillow, embroidery, etc. It was common during the Revolutionary War for upholsterers to take on extra business for the army and navy, including making tents, blankets, uniforms, powder bags and... flags. Betsy Ross never traveled away from the colonies during her lifetime. Betsy Ross married three times. Her last husband was John Claypoole. This signature is from the Quaker meeting house attendance book. Quaker churches were known for keeping very accurate attendance records. Betsy Ross married three times, her first two husbands died as a result of the Revolutionary War. First husband - John Ross. 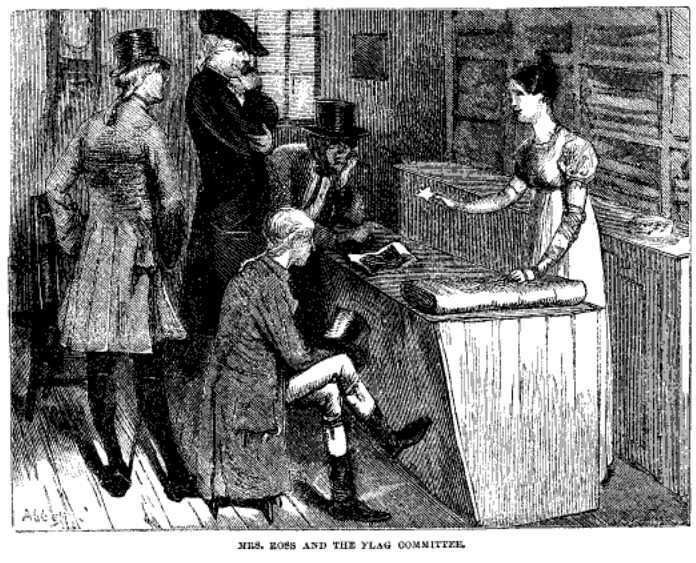 Betsy met John Ross while they were both apprentices with Philadelphia upholsterer William Webster. The two eloped in November, 1773. She was 21. They ferried across the Delaware River to Gloucester, New Jersey where they were married at Hugg's Tavern. The marriage caused Betsy to be "read out" of the Quaker Church, which did not approve of interdenominational marriages. To be "read out" of the church meant being cut off economically, emotionally and from one's own family. She was publicly ex-communicated from the church and disowned by her family as a result. In spite of this, Betsy became a member of the Episcopalian Christ Church, Philadelphia's most influential church, because this was John's church, his father being an assistant rector at the church. John and Betsy started their own upholstery business in 1774 on Arch Street in Philadelphia in what is now known as the "Betsy Ross House," which is still standing today. The Ross' never owned the home, but rented it. Starting in business was a bold move for the young couple because they would not be able to rely on any of Betsy's former Quaker friends for business after her ex-communication. Once the Revolutionary War began, John joined the Pennsylvania militia. In mid-January 1776, John was guarding ammunition in Philadelphia when there was an accident resulting in life threatening injuries. Betsy tried to nurse John back to health, but he died from his wounds on January 21, 1776. He was buried in Christ Church cemetery. He and Betsy Ross never had any children. Second husband - On June 15, 1777, Betsy Ross married again, this time to Captain Joseph Ashburn. During that winter, their home was forcibly occupied by British soldiers when Philadelphia was occupied. Joseph and Betsy had two children, the first of whom died in infancy. In 1780, Joseph was sent on a mission to the West Indies where he was commanding an American privateer to procure military supplies for the war effort. While on the mission, his ship was captured by a British ship. He was charged with treason and sent to prison in England. While he was in prison, the Ross' first daughter Zilla died at nine months old and their second daughter Eliza was born. John became ill and died in the notorious Old Mill Prison at Plymouth in March 1782, several months after the surrender of Cornwallis at Yorktown. Betsy was 30 years old when her second husband died. Third husband - John Claypoole was another sailor who happened to be in prison at the Old Mill with Betsy's second husband Joseph Ashburn when he died. John was an old suitor of Betsy Ross. He came personally to Betsy's home after he was released to tell her of the news of her husband's death and bring her his last words. John's meeting with Betsy rekindled their old friendship and romance and they were married in May, 1783. John had fought in several battles under General Washington and was injured at the Battle of Germantown. Betsy talked John into abandoning the sea and he began to work in her upholstery business. Later he became an employee of the US Customs House in Philadelphia. John and Betsy had five daughters, four of whom lived to adulthood. They were very active in the Free Quaker church. John suffered a devastating stroke in 1800 that caused him to need almost constant nursing for the rest of his life, which Betsy attended to, but he did not die until 1817. Aucilla Ashburn (known as Zillah), born September 15, 1779, died in infancy. 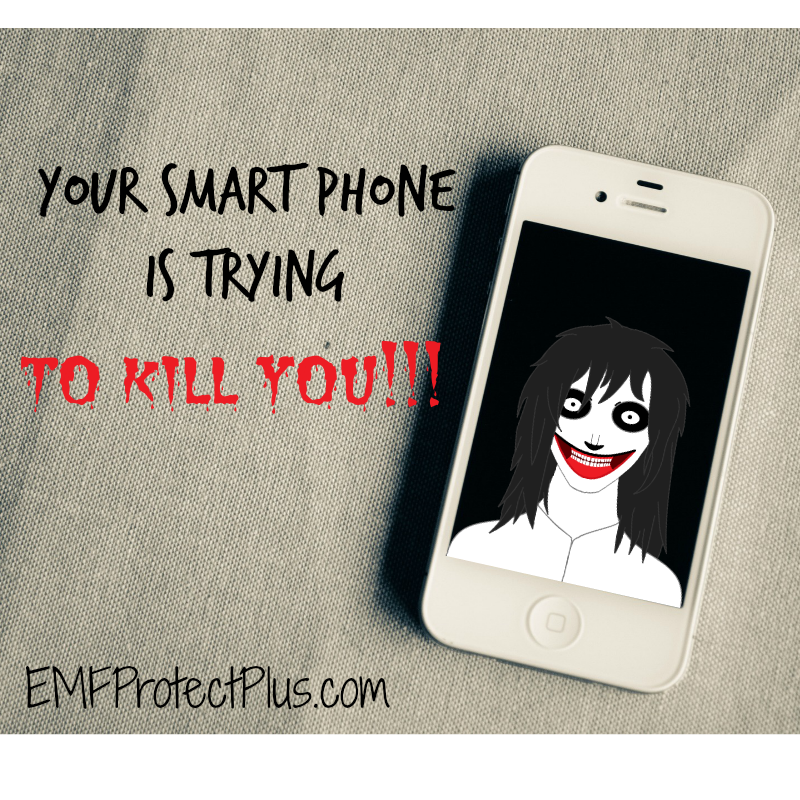 Elizabeth Ashburn Claypoole Silliman (known as Eliza), born February 25, 1781, died ? Clarissa Sidney Claypoole Wilson, born April 3, 1785, died July 10, 1864. Clarissa took over Betsy's sewing and flag business after her retirement. Susannah Claypoole Satterthwaite (known as Susan), born November 15, 1786, died June 11, 1875. Rachel Claypoole Jones Fletcher, born February 1, 1789, died 1873. Jane Claypoole Canby, born November 13, 1792, died January 4, 1873. Harriet Claypoole, born December 20, 1795, died October 8, 1796 in infancy. Betsy Ross' first husband was John Ross. John's uncle was a Philadelphia lawyer named George Ross who was a Pennsylvania delegate to the Continental Congress and a signer of the Declaration of Independence. Gertrude Ross Till, was the widowed aunt of John Ross and the sister of George Ross. Gertrude married George Read, a Delaware lawyer who also was a member of the Continental Congress and a signer of the Declaration of Independence. This means Betsy Ross' husband John had two uncles in the Congress who signed the Declaration. The Betsy Ross House was the home of Betsy Ross from 1773 to 1785. This is the home where Betsy Ross was living when the secret committee from Congress, including George Washington, Robert Morris and George Ross came to ask her to make the first American flag. Betsy's upholstery shop was in the front of the house and her private room was at the back. Betsy rented the home and the owner of the home lived in the rest of the house. The front part of the home was built nearly 250 years ago and is a variation of a "band-box" house, with each floor making up one room with a spiral staircase ascending from the cellar to the top floor. The back part of the house, which is where Betsy's parlor was located, was added on several years later. This parlor is where Betsy and the secret committee allegedly discussed the flag. The home was generally recognized as being the place where Betsy Ross created the Betsy Ross Flag by at least the 1870's. By the late 1800's, the home was falling into disrepair and most of the other Revolutionary War era homes around it had been torn down and replaced with warehouses and other buildings. Concerned citizens formed the American Flag House and Betsy Ross Memorial Association in 1898 to restore the house and see it opened as a museum. Artist Charles Weisberger was one of the original members of the Association. Weisberger moved into the house with his family in 1898 and they immediately opened a gift shop in the front room and the back room where the famous meeting allegedly took place for visitors to tour. Charles Weisberger painted the painting Birth of our Nation's Flag in 1892. The painting was displayed and admired by many at the 1893 World Columbian Exposition in Chicago. When the Betsy Ross Memorial Association began to raise money to restore the Betsy Ross House, they encouraged people across the nation to give a dime for the restoration. In return, people were given a "lifetime membership" to the Association and a certificate imprinted with the image of Birth of our Nation's Flag. Those who could get 30 of their friends to give received a full color reproduction of the painting suitable for framing. In 1937, radio mogul Atwater Kent, who was the largest manufacturer of radios in America in the 20s and 30s, gave $25,000 to restore the Betsy Ross House. The home was restored by architectural historian Richardson Brognard Okie, who restored many of the home's Revolutionary War era features, including its fireplaces, stairwell, doors and more. The home was reopened in its current condition on Flag Day, June 14, 1937. Atwater Kent purchased some adjoining properties to the Betsy Ross House in 1941 where an outdoor garden was created. The property was given to the city of Philadelphia at that time. In 1965 an adjoining building was purchased and the garden was renovated. 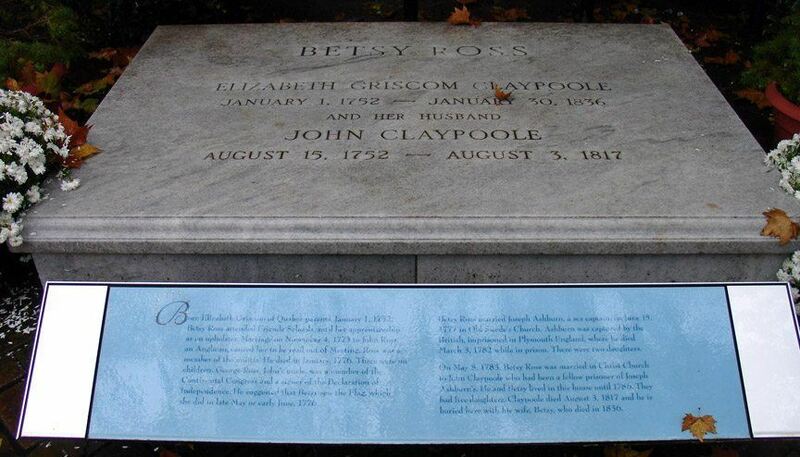 In 1976, the remains of Betsy Ross and her third husband John Claypoole were moved from Mount Moriah cemetery in Yeadon, Pennsylvania to the garden at the Betsy Ross House where you can visit the graves today. 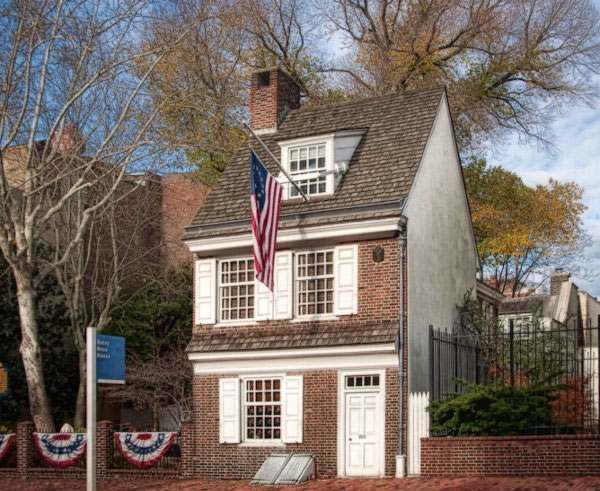 Since 1995, the Betsy Ross House property has been leased from the city of Philadelphia by a nonprofit organization called Historic Philadelphia, Inc., which runs the site for the city. Today the Betsy Ross House is furnished with decor from the time when Betsy Ross is said to have lived in the house. Seven rooms are viewable including the kitchen, bedrooms, the parlor where Betsy Ross met with George Washington and the secret flag committee and the country's only replica of an 18th century upholstery shop. Several articles that belonged to Betsy Ross can be seen in the home, including her walnut chest-on-chest, her Chippendale and Sheraton side chairs, her eyeglasses, her quilted petticoat and her Bible. In addition, the Betsy Ross House now features a large 34 star American flag that was made by her daughter Clarissa at the time of the Civil War to celebrate the admission of Kansas into the union. Over 250,000 people visit the Betsy Ross House each year. Only the Liberty Bell and Independence Hall draw more visitors in Philadelphia. You can learn more about visiting times and how to get to the Betsy Ross House here. Americans for generations have been raised on the legend of the Betsy Ross Flag, allegedly the first American flag, which was created by Betsy Ross at her upholstery shop in Philadelphia. There is, however, much controversy among historians about whether or not this story is true. The legend goes that George Washington, Robert Morris and George Ross, who were all members of Congress showed up at Betsy's shop sometime in May of 1776. They told her they had been appointed to a secret committee to create a flag for the United States. They asked Betsy Ross if she could create a flag. She told them she hadn't made one before, but didn't doubt that she could do it. They then proceeded to Betsy's parlor where they showed her a preliminary design. Betsy allegedly made some suggestions, including that the flag have five-pointed stars instead of the drawings six-pointed stars. The committee liked her ideas and the flag she produced was later approved by Congress. The main source for this story is several of Betsy's relatives who testified that they heard her tell from her own mouth that she had created the first American flag. Three relatives signed written affidavits and her grandson William Canby told the story in a paper written and delivered orally to the Historical Society of Philadelphia. No other documentation exists that can verify the story. There are no records of it from the Continental Congress, no receipts, no other independent verification. This has caused many to doubt the story. Some have even suggested that William Canby created the story for his family's fame. Others have said the legend was created to encourage patriotism during the Civil War or to create a female hero from the American Revolution. There is lots of information to read regarding the Betsy Ross Flag controversy, including many facts that actually support the legend. Read more about the history at our Betsy Ross Flag page here. The Revolutionary War greatly impacted the life of Betsy Ross. When the war began in April 1775, the colonial economy plummeted. As a working family, John and Betsy Ross found upholstery and seamstress work harder and harder to come by. Economic hardship was common for many families during the war. Betsy's husband of two years joined the Pennsylvania militia that year. In January of 1776, he suffered devastating injuries in a large explosion as he guarded ammunition in Philadelphia. Betsy tried to nurse her husband back to health, but he died from his injuries a few days later - the first death of someone close to her as a result of the war. The incident that brought Betsy Ross to fame occurred a few months after her husband's death. According to legend, a secret committee came from Congress to ask her to sew the first American flag - the familiar stars and stripes with the stars formed in a circle. Betsy Ross even allegedly influenced the design of this iconic flag. The committee had shown her a design with six-pointed stars and Betsy encouraged them to change to five-pointed stars because they were easier to manufacture. She allegedly showed them how to make a star with a few folds and a single snip, which impressed them. Congress eventually chose Betsy's design for the first flag and she embarked on a flag making business for the government for the next 50 years. Read more about the Betsy Ross Flag here. Betsy remarried in June 1777 to Joseph Ashburn. Their home was forcibly occupied by British troops during the British invasion of Philadelphia that winter. This is the same winter the Continental Army suffered so miserably at Valley Forge. Betsy's second husband Joseph was a sea captain. He joined a mission sent from the Continental Forces to the West Indies for military supplies in 1780. His ship was captured by a British frigate. Joseph was charged with treason and sent to prison in England. Betsy waited for months not knowing anything of Joseph's fate. She continued to raise her young family and make quilts and blankets for the army. Their first daughter Zilla died while Joseph was in prison and Betsy gave birth to their second daughter Eliza. Joseph became very ill in the notorious Old Mill Prison in Plymouth, England where he died in March 1782, several months after the surrender of Cornwallis at Yorktown. This was the second death to impact Betsy's family intimately as a result of the war. The news of Joseph's death was brought to Betsy by John Claypoole, a former suitor of hers who had also been in prison at the Old Mill with Joseph at the time of his death. John had fought in several Revolutionary War battles under General Washington and was injured at the Battle of Germantown. Later he was captured at sea and sent to prison in Ireland. He was eventually transferred to the Old Mill in Plymouth where he joined Joseph. When John was released he brought news of Joseph's death and his dying words of love to Betsy which rekindled their old relationship. John and Betsy married in May of 1783. Betsy Ross married her first husband at the age of 21 and was widowed at 24 when he died in a gunpowder accident. The first of two husbands she would lose as a result of the war. Betsy Ross was ex-communicated from the Quaker church and disowned by her family when she married her first husband, John Ross, who was anEpiscopalian. She then joined him as a member of the influential Episcopalian Christ Church where his father was an assistant rector. After suggesting to the secret flag committee that the flag have five-pointed stars instead of six-pointed stars, George Washington, who was then Commander-in-Chief of the Continental Army, sat down in Betsy's parlor and redrew the flag design in pencil incorporating her suggestions. 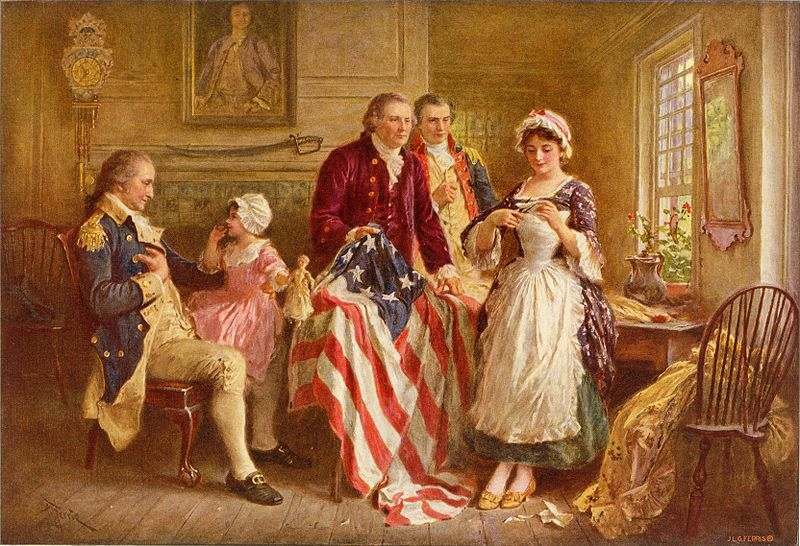 John and Betsy Ross apparently knew George Washington before the secret flag committee arrived at her home to ask her to make the first American flag. Betsy Ross told relatives that Washington was a frequent guest at her home for social visits as well as for having clothes tailored. Betsy Ross' pew, number 12, at Christ Church was right next to George Washington's pew. People sat in their own regular pew in church at that time, so every time they were in church at the same time they would have seen one another. This may have been how they became friends. 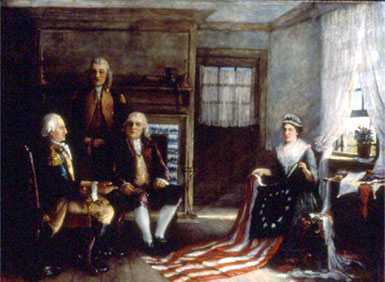 Betsy Ross' first husband John had two uncles who signed the Declaration of Independence, George Ross and George Read. These close family relations may have been part of the reason she was allegedly asked to makethe first American flag. The name of William Franklin, Benjamin Franklin's son appears on Betsy Ross' marriage certificate because he was the governor of New Jersey at the time she was married. Betsy Ross' relationship was cut off from her family due to marrying outside of the Quaker faith. William Franklin's relationship with his father was also irrevocably cut off three years later because William remained loyal to the King and would not turn his back on England as his father did. The early part of the Revolutionary War was rough on Betsy. Her first husband died in a gunpowder accident and the economy plunged due to the war. Sewing jobs were very hard to come by. The secret committee that asked her to create the first American flag changed all that for her though. Congress allegedly ordered all the flags Betsy could make, a job which she continued in for the next 50 years! Betsy told her family that after that day she never had to look for employment again. Betsy Ross was known for caring for the sick and the poor. It is said that the sick would often seek her out before they would go to the doctor because of her successful homemade remedies. Betsy Ross claimed to have done tailoring for George Washington, specifically mentioning having done work on ruffles for his shirts and on cuffs for his sleeves. 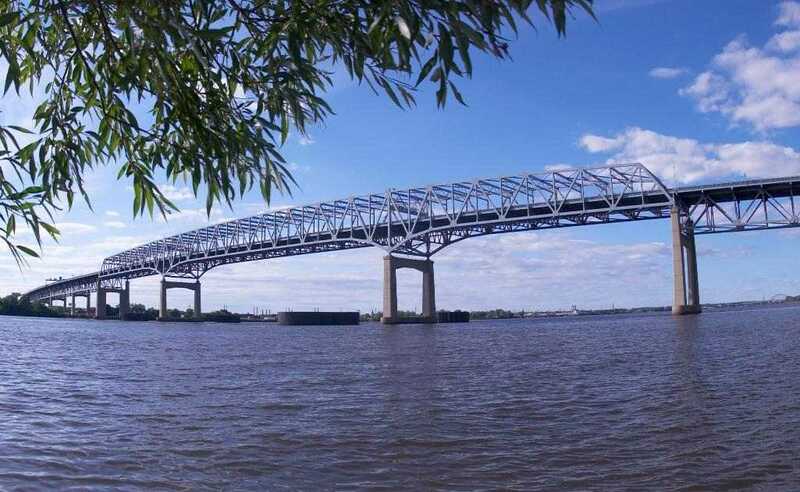 The Betsy Ross Bridge spans the Delaware River from Philadelphia to Pennsauken, New Jersey. It is a six lane highway that opened in 1976. The Betsy Ross Bridge is only the second bridge in America to be named after a woman after Iowa's Kate Shelley High Bridge in 1912. Samuel Wetherill was a close friend of Betsy Ross for many years. His son, John Price Wetherill, and Betsy were the last two living members of the Free Quaker Meeting House, who shut the church down in 1834. A Weatherill family tradition stated that Samuel Wetherill visited Betsy Ross shortly after her meeting with the secret flag committee. Betsy told him of the meeting and showed him the five-pointed star she had cut for them. Wetherill recognized the historic importance of the event and asked her for the star, which she gave him. Wetherill then put the star in the family safe where it stayed for years. The safe was discovered in 1925 and opened. The Betsy Ross star was still inside. The star was displayed at the still standing Free Quaker Meeting House for many years, but has since gone missing. The Betsy Ross Flag is sometimes confused with the Mary Young Pickersgill flag, otherwise known as the Star Spangled Banner Flag. The Pickersgill flag is the very large (30'x42') flag that flew over Fort McHenry during the War of 1812. It was made in 1813 and was the inspiration for Francis Scott Key to write the song that would become the National Anthem. Pickersgill's flag hangs at the Smithsonian Institution in Washington, DC. More than two million Americans donated their dimes to the Betsy Ross Memorial Association starting in 1898 to help buy the Betsy Ross House and open it as a museum. Besides allegedly creating the first American flag, Betsy Ross is known to have sewn gunpowder bags, tents and blankets for the Continental Army. Betsy Ross lost two husbands to the Revolutionary War. John Ross died in an accidental gunpowder explosion. Her second husband, Joseph Ashburn, died in the notorious Old Mill Prison in Plymouth, England where he was sent after having been captured at sea and charged with treason. Can a five-pointed star actually be made with several folds and a single snip as the Betsy Ross Flag legend tells?? Yes! Learn how to make your own Betsy Ross Star here. 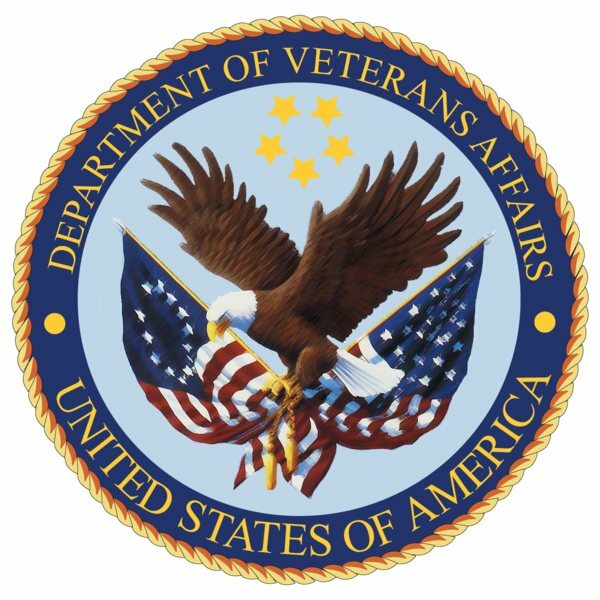 The United States Department of Veterans Affairs uses the Betsy Ross Flag in its official seal to represent American veterans of all wars since the American Revolution. 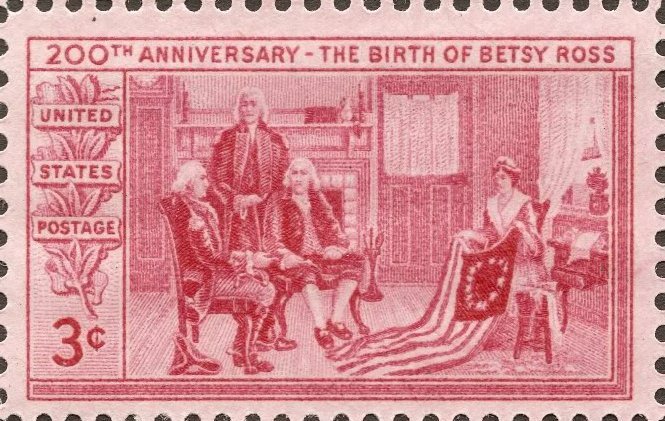 In 1952, the United States Post Office issued a special stamp commemorating the 200th birthday of Betsy Ross. The depiction on the stamp is the Charles Weisberger painting Birth of our Nation's Flag. Betsy Ross' grandson, William Canby's account of the Betsy Ross Flag story given to the Historical Society of Philadelphia in March, 1780 - The History of the Flag of the United States by William Canby. "She did not know but she could try; she had never made one, but if the pattern were shown to her she had not doubt of her ability to do it." Betsy Ross retired from flagmaking and her upholstery business in 1827, ten years after her third husband died. Upon retirement, Betsy moved in with her daughter Susanna Satterthwaite in Abington, Pennsylvania which was then a remote distance north of the town (it is a suburb of Philadelphia today). She lived there for several years. Betsy lived the last three years of her life with her daughter Jane Canby and son-in-law Caleb Canby(William's mother and father) at No. 63 Cherry Street in Philadelphia. She became blind in 1835 and passed away there the following year. Where was Betsy Ross buried? Betsy Ross was originally buried in the Quaker burial ground on South 5th Street in Philadelphia with her husband John Claypoole. 20 years later, their remains were exhumed and transferred to Mt. Moriah Cemetery in the Cobbs Creek Park section of Philadelphia. In 1976, the remains of Betsy Ross and John Claypoole, were exhumed and transferred a third time to the garden of the Betsy Ross House where they can be visited today. "Born Elizabeth Griscom of Quaker parents, January 1, 1752, Betsy Ross attended Friends Schools until her apprenticeship as an upholsters. Marriage on November 4, 1773 to John ross, an Anglican, caused her to be read out of Meeting. Ross was a member of the militia. He died in January, 1776. There were no children. George Ross, John's uncle, was a member of the Continental Congress and a signer of the Declaration of Independence. he suggested that Betsy sew the Flag, which she did in late May or early June, 1776. Betsy Ross married Joseph Ashburn, a sea captain, on June 15, 1777 in Old Swede's Church. Ashburn was captured by the British, imprisoned in Plymouth, England, where he died march 3, 1782 while in prison. There were two daughters. On May 8, 1783, Betsy Ross was married in Christ Church to John Claypoole who had been a fellow prisoner of Joseph Ashburn's. He and Betsy lived in this house until 1786. They had five daughters. Claypoole died August 3, 1817 and he is buried here with his wife, Betsy, who died in 1836." 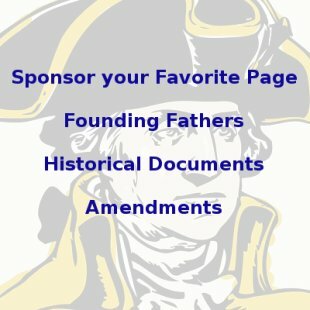 Read our George Washington Quotes. Learn about George Washington Valley Forge. Learn about some of the most famous George Washington Pictures here. Find George Washington Books and Gifts here.